Have you heard the news? 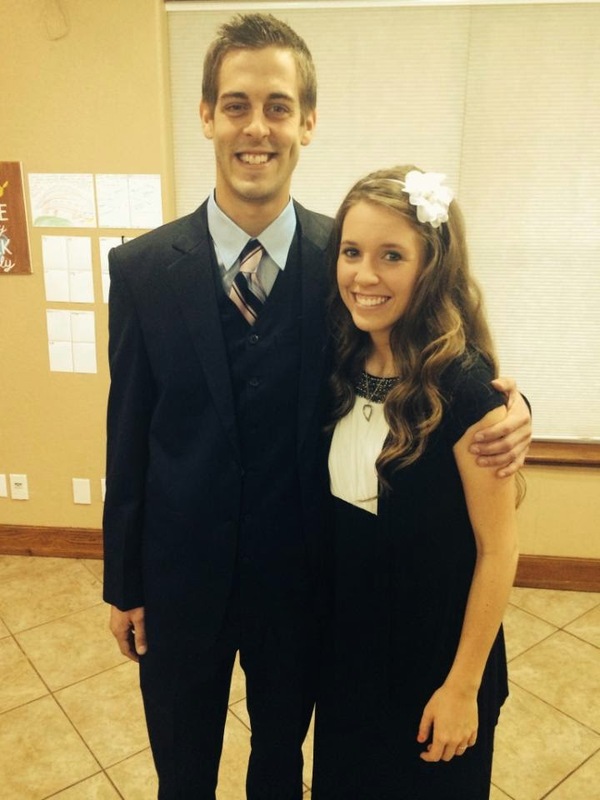 Jill Duggar is in a courtship! 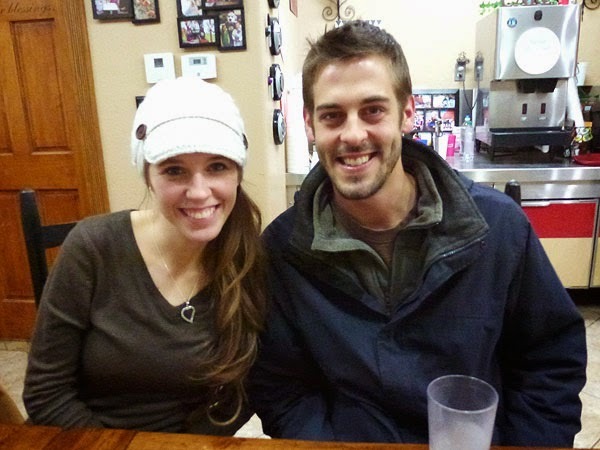 His name is Derick Dillard, he is 25 years old, and he lives in Rogers, a town about 30 minutes from the Duggars' house. Jim Bob got to know Derick a couple years ago, and the two became prayer partners while Derick was doing missionary work in Nepal. "I was impressed with him as I got to know him over the years," Jim Bob told People Magazine. "He sounded like an amazing young man. I felt like from the beginning, they had similar personalities and goals. I thought they would hit it off." Jim Bob gave Jill's number to Derick, and the two began chatting via Skype and texting. "We got to know each other in the first few months pretty quickly," Jill, 22, told People. "I was in love with someone I had never met in person, but we really knew each other well." 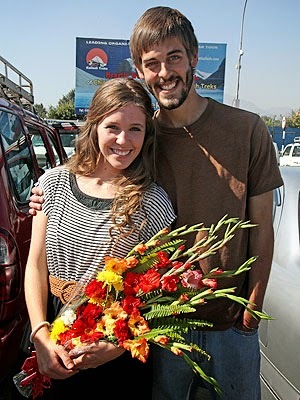 Jim Bob accompanied Jill to Nepal in November so the couple could meet, and Derick asked Jill to court him. She said yes! "I was really impressed with his character, and I was surprised how much we have the same vision and life goals," said Jill. "He's a great guy." Derick, who has an accounting degree and is in seminary, comes from a family with only two children, so spending time with the Duggars is a big change, but he has enjoyed getting to know them. "We have a large pool of chaperones," said Derick, laughing. "You have to come in armed with good jokes and I usually have Skittles as well." Michelle is enjoying this season of life, but realizing that her older children will soon be moving out and starting families of their own is bittersweet for the mom of 19. "We are cherishing this time together," she said. Is he still in Nepal? Derick spent two years in Nepal but is back now. He lives near the Duggars in the town of Rogers. - He went to Oklahoma State University and obtained a bachelors degree in accounting. - He was OSU's mascot, Pistol Pete. His father held the same role back when he was in college. - He has one brother by the name of Daniel Dillard. No other siblings. - His father passed away while he was in college. - It appears his father was on the police force for a time. - He currently works for Walmart as an accountant, a job he obtained about 2 months ago. - He grew up in a "godly home" and said he was "saved" in the third grade. - He is an Eagle Scout. - He's been doing missionary work for the past two years. awe... what exciting news!! God is good. Great news! It seems like they are both in the right place in life to get married. He has a degree from U of OK in Accounting and is 25 with real life experience and both Jill and he have similar goals and interest. I'm happy for Jessa but I think Jill has found a better match that is ready for marriage and kids. I hope Jessa works out but Ben being 18 with no higher education, or long term job, or real life experince still worries me. Is Derick ATI? I read he was an eagle scout which is not allowed in ATI? At 25 there's not much life in which to have had experience. I was surprised to learn HE has a college degree from a REAL legitimate college. All ANY if the older Duggar children have is GED's. As for being a licensed midwife; I don't know what the state requirements are in Arkansas but here in NY state where I live, to be a professional licensed midwife you have to first have a Masters Degree in Midwifery or in Nursing. Then you must apply to take the state exam. Once you've passed the exam you are then eligible to apply for your license. And the fee for the license is $322.00. The Duggar girls wouldn't qualify here in NYS. Correction. His degree is from Oklahoma State University - not U of OK. Don't insult a former Pistol Pete. Why did they keep this a secret? everyone Knew that Jill was in a courtship of just how Jill talked. Everyone olso knew that Jill was in a courtship because of the interveiw that Johannah and Jordan said she was. They did keep it a secret because Jill did not raise her hand when they asked. Will the new season show Jill's courtship at all? Please Please tell me. This is such sweet news ! So happy for them! Do you girls know about this earlier? Thank you for allowing us fans to be surprised! I'm so thankful for you ladies and this blog!! Nice big blue eyes, or is that noticing too much? Congratulations to Jill and Derrick on being in a courtship! Wishing you both well. Why did they subject poor Jessa to the preseason publicity and keep Jill under wraps? I was so happy when I found out!! Well, that sure explains the Nepal thing perfectly :) Loving this so much! To God be the glory! Wow!! That's soo awesome!! So excited for Jill! Congratulations!!!!! what a beautiful couple. so happy for both of you. Looks like Jill and Jessa pefer a man with a little scurf. love it. Do you know if Derick will be showed on this season?? I hope he will be. Congrats to Jill and Derick!! Can not wait for the season to start tomorrow night!! How long have they been courting? Do any of the children want to go to college and pursue a degree. I was just want to say first off that I love your TV show. I respect everything you are doing with raising your children because you are raising them to have great moral values and that is so hard to find these days. Although I am not really sure what courtship is and how it differs from dating. Does it mean that the person they are courtshiping with is the one they will marry?. Also I am jealous of your big family I have always wanted a big family, and have so many people around to love you. I have also dreamed of meeting your family, I have watched your show for years and it is cool to see how everyone has grown up. When I get older and have kids, I will give them so much love and good morals just like you do. Although I do not understand how you keep such a calm tone when parenting I don't think I have ever seen you yell. Awesome! Thrilled for them. Jill is a sweet young woman and deserves the best. Jim Bob knows that Jill loves doing missionary work and her personlity would fit Jill better then Jana. Thank You!! Oh, it sounds like a great match! Jill is pursuing some midwifery degree and soon will have a profession in hand. Her boyfriend has education, spent 2 years in Nepal on a mission (and Jill went on many mission trips too herself), they seem to have so much in common, and they both are at a stage, where they can both bee responsible adults, have family, provide for children... And the guy is nice looking too! So happy for Jill! I also like Jill/Derick combination better than Jessa/Ben. They just seem so much more mature. Jessa is just a year behind Jill, but we saw on TV her only making coffee once at some coffee shop. She seems to have a strong personality, but no really life experience. Ben is just 18, and he might be mature for his age, but still he also lacks life experience. I just would want to see Jessa having some career before she starts her family, it might be very rewarding, and she seems like a very smart girl too. Anon 29- I'm sure JimBob prayed first to see if God thought one of his girls might be a potential match with Derrick. As a parent, I know I have prayed asking for the right Godly man for my daughter and a Godly woman for my boys. After spending time with him over the two years and hearing of his interests, it makes sense that he would match him with the daughter that was most like him with interests and goals in life. Excited to see where God directs each family member with their courtships. Arranged marriages are just plain creepy. I watch Sister Wives and My Five Wives and The Duggars. All three shows to me are distorted. Entertaining to see how other people live, but distorted. And it astonishes me that The Little Couple was able to adopt when the mother was diagnosed with cancer with an iffy outsome. Anonymous 29, I can understand that you are sympathetic towards Jana but the idea that the persons who have now begun courting are out of order is sort of dishonoring. Jill and Derrick make a nice looking couple and the sneak peek showed Jill expressing the love she feels, he asked her to enter into a relationship, albeit with some of Jim Bob's match making; they are all making their own decisions. Jana did say she takes her heart to the Lord Jesus and finds he is there for her, I imagine some of the storms in her life are feeling the whirlwinds of excitement that are going on in some of the other girls lives. But she will also go through things that are her very own and I think she has the sense to dig in her heels and stand strong and enjoy being part of everything and not make it all about herself losing out. She is not a drama queen and she will not want to miss what ever God wants for her, she said she gave every area of her life to God. She is very patient. Good answer, I agree. Also, since Jana & John David are twins and therefore the same age, it only seems fair for people to ask "why isn't John David married yet?" if they're going to ask about Jana. And, for what it's worth, ALL of the kids (even Josh and Anna) are still quite young, and all well under 30... So it doesn't seem strange that most of them are still unmarried. Guess Jana is needed at home to help Michelle with all those kids. And with so much cooking, cleaning and homework, she doesn't really have time to date. 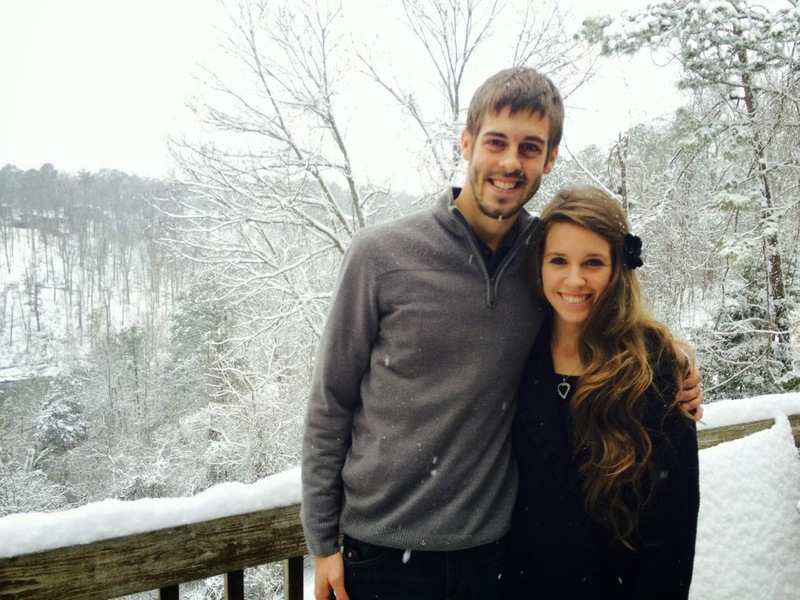 The duggar girls are inspiring to us all. It is really hard to try and stay pure with society telling everyone different things. It is really easy to leave God behind. They are such an inspiration. Derick seems to be a really great guy. tulsaworld.com has a very touching article from 2009 on him following in his dad's footsteps as Pistol Pete. What an awesome young man that ends up living just thirty minutes down the road! What wonderful news for Jill. It certainly must not be easy having such popularity when going through early courtship. While the intention is always to progress to marriage, there is always a chance that one person, or the other, might realize that the match is not a good one. Just look at Zach Bates and his first courtship. I think that Ben played a major role in the early announcement of his courtship to Jessa. News travels fast, especially when a person uses social media. Ben had a public facebook page and twitter before courting Jessa and I think that some of his pictures and posts alerted people close to him. Once that happens, it doesn't take long for the general public and media to find out. I think that might be the real reason why the early announcement and rushed reaction posted in the last episode before the midseason break. Jim Bob said a thought was in the back of his mind...and it must have been a true thought; there is no re thinking this ( re: anonymous 29), it seems like it is kismet for Jill and Derrick! Jana has lots of patience, I think with everything going on she is having a fun time, (re: anonymous 29) it would be a shame if anxiety for her self robbed Jana of sharing in all the joy that is currently going around, like you suggested. Worrying would not change a thing, and it is clear one day her prince charming will arrive on the scene and Jana will be available =lovely, unselfish, pure, happy, etc. etc., another story. Have faith! Congratulations to the happy couple! Great show and such a neat family! I'm in the process of reading "Growing Up Duggar." So pleased to read this happy news! God bless! How long is a courtship? Do the couple have to prove financial independence before the courtship can begin? I love how these children are so well composed. I knew Jill was courting! Lily and Ellie, I'm wondering if you can answer a question.... Something that puzzles me about the Duggar-style of courtship is that it seems as if they assume that whoever they start courting is DEFINITELY the person they will marry. But I thought courtship was supposed to be the process in which to evaluate IF this is the person you should marry. How can you know you want to marry someone until you really get to know (i.e. court) them? When the Lord GOD JAH RASTAFARI puts his HUMBLE servants together there is nothing that can interfer with HIS PLANS, CONGRATULATIONS TO YOU ALL, MORE BLESSINGS I just LOVE your show, I haven't been able to watch it for sometime, due to some misfortunes in our household, but please PRAY for my FAMILY, TO JAH RASTAFARI BE THE GLORY, PRAISES. EMPRESSKATORJAH ND FAMILY. You have a lovely family. My concern is that you keep your children "too close" to you. Encourage them to go to college, get their own places, etc. They need to interact more with young adults their own age. Keeping them at home "stunts" their emotional, social, and mental growth. Let them be the adults they are! You've taught them well. Now, let them go. And let the chaperone thing go! They need to talk and meet temptation and overcome it. It's good to see the girls wearing more appropriate dress. They can look modest without skirts to their ankles! @AnonymousThe little couples adoption was final before she got the cancer, if you watched the previous episodes you would know that.Watch last years episodes and then the first two of this year and then you will be up to date. I am genuinely baffled by certain comments. t I don't see how their mental and emotional growth has been stunted by their upbringing. It seems to me that this family is actually very well developed. I interact with numerous college aged people and frankly I believe that many of the experiences these children have been exposed to and the level of their development in many areas is actually superior in some ways to the levels I have observed among young people. As far as their clothing goes, we are just so accustomed to wearing pants we don't forget there is NOTHING wrong with girls wearing skirts. Though I personally may be sitting here writing this in yoga pants, I just don't understand why it is even an issue for so many people that they opt for a more feminine and modest style of dressing The females in the family look great! It doesn't bother me in the least that Mennonite women and Amish women wear dresses, or that some Jew and Christian women opt to opt out of the pants option. I hope my personal opinions haven't offended any of the other commenters here who don't see this issue the same way I do. I am not trying to be argumentative with anyone else on this blog and I hope you will forgive me if I rankled anyone's feelings . Him being 18 shouldn't worry you. They will be fine and just because he's young doesn't mean he won't be a good father or husband. Jim Bob was 19. Keep that in mind and let Jessa court her 18 year old dream man. I ve seen several comments about why was this kind of kept quiet. Maybe Jill is shy? She did not choose to be in the public eye so perhaps she and her beau have asked to be allowed to keep this time more discreet and less public. As for stunted mental growth they have never ever been allowed the chance to be tempted. They have been raised so right but yet not trusted to make their own choices? Some day they may actually live away from the family cloister, how will they be able to handle temptation when literally ever choice in their world is and has been made for them. I do find the dad arranging the men his girls very creepy. And as a nation we are appalled when Muslim and other faiths do this yet in this case its practically celebrated? Are they really expected to marry the first man who is literally sent their way? IDK I stopped watching when it really became obvious they have become about the attention. Maybe before they adopt they should send all the girls older than 10 to visit a relative and really see if Mom and Dad can actually do the parenting they say they do. I also stopped watching when it became obvious no matter what they do no one says anything bad. There have been several shown instances where lack of supervision has lead to injury and on one episode a News guy spent the day with them literally said the kids have no supervision most of the time. There are clearly supervision issues, the episode where one of them fell into a choir pit at a church they were visiting as well as in the same episode they arrive at a home they are visiting and the kids literaly go nuts and Mom just smiles and says they were cooped up so long. Take a good look at the Homeowners and their kids faces its an eye opener. If you go back and watch the specials and season 1 the vibe is super different more relaxed less focused on the publicity. I sincerely hope Jill and Jessa have wonderful long marriages and move away from home. I am glad to hear Jill is seeking a college education. But let them have their privacy. We dont even need to know what they do on dates or how they hug or anything. They aren't zoo animals folks they are real people. I stopped watching a while back too. I think they lost focus after the first few seasons and now the show totally runs their lives. They have all changed. The children have lost some of the sweet spirit they had and do seem very self focused now. I think the father has been unwise in putting his family throughconstant filming and has deprived them of normalacy. its all about the show now and how many kids they can have. I love and respect the Duggars family! The love and values in that family are truly inspirational. What I want to know is if the girls are going to go to collage and have jobs outside of the home? Or are they just going to be stay at home moms and have large familys. What would happen if one of their future husbands only want 1 to 2 kids? Would that be a problem? Or if the future husbands want for their wifes to work outside of the home and contribute financially? @Cammie There is no such place as the U of OK :) You might have some unhappy Sooners or Cowboys on your hands. The University of Oklahoma, which is where I attended University, is in the town of Norman, Oklahoma& is called "OU". Oklahoma State University, or OSU, is in Stillwater, Oklahoma. The two schools are rivals, especially in football! My father has degrees from both schools but prefers OSU, so we have a friendly rivalry. Oh for goodness sake, of course he is nor a Mormon. Why even ask that? I have no idea what this "ATI" thing is or what it has to do with Eagle Scouts. Whatever it is, does it really matter, or are people just looking for "dirt" on these people? I can't decide which couple is cuter! Derick is beautiful, not creepy at all! Jeez. I'm glad the girls are with guys they like. Michelle and Jim Bob complaining about Jill and Derick's frontal hug at the airport was pathetic! They are adults, and there were hundreds of ppl around. Get over it Mom and Dad ! Hi, I love your website! Do you know when Derick's birthday is? I heard Jill's is in May and was just wondering when Derick's is? I would love to know Derick's birthdate as well as, Ben's. 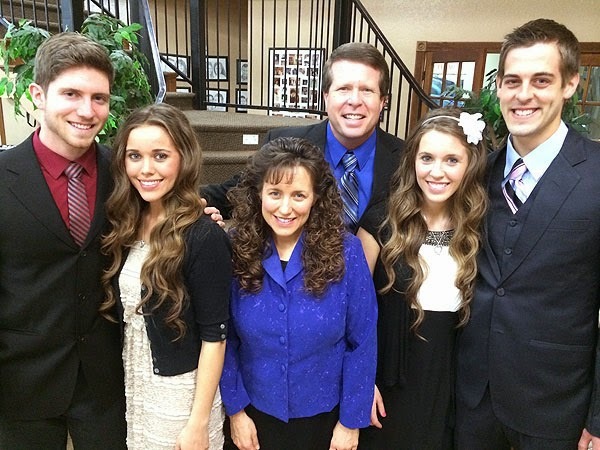 You have an awesome family, Duggars! We love watching your family grow up! You have a beautiful family! May God bless you! Are Dericks parents divorced? I never see his dad? I read that his dad died while he was away at college. Jill (and all the daughters) have grown into such beauties. I wish her all the best in the world with her new husband. I've seen so many of their episodes and feel that I am somehow a part of this as well. A happy long marriage for them! Does anyone know when Derick's birthday is?